It’s no accident that most of the killers in Rob Zombie’s House of 1000 Corpses movies are named after characters from old Groucho Marx comedies. There’s a super dark streak of comedy running through Zombie’s movies, a glimmer of humor hidden underneath a heaping pile of uglines. Nobody’s a better illustration of that than Captain Spaulding, the foul-mouthed, creepy clown who runs a shady roadside house of horrors when he’s not out on a murder spree. Captain Spaulding is one of those horrifying characters you just can’t help but love, a sneering, sickening, slob who approaches every situation with a stained-toothed grin. Now you can slide into your favorite face of evil (or more specifically, the face of the legendary b-movie actor Sid Haig) in this officially licensed latex mask. 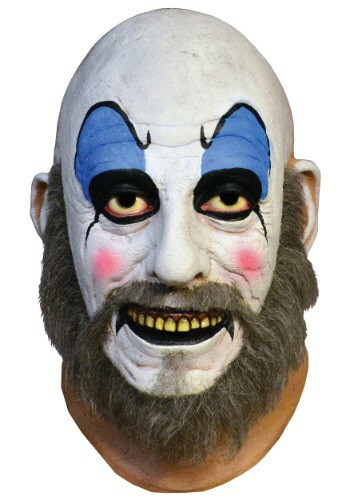 Stroll into the party wearing Spaulding’s familiar clown makeup, scruffy beard, and cynical smirk and you’re sure to get a lot of love from anyone who’s seen the films. Not to mention some leery looks from anybody who hasn’t, but that’s just the way Captain Spaulding would want it.